Reggie is 14 weeks old and a very busy girl. She was constantly underfoot while we were canning spaghetti sauce, so we made a bed near the kitchen table where she could be near the action, and then gave her a jar ring to play with to keep her occupied. She finally fell asleep with her nose through her new "toy." She's so cute isn't she! She's a good size, I have a one year Jack and she's bigger than he is. He's only 13 pounds but acts like he's a 300 lb dog ready to kill....lol. Join in and write your own page! It's easy to do. How? 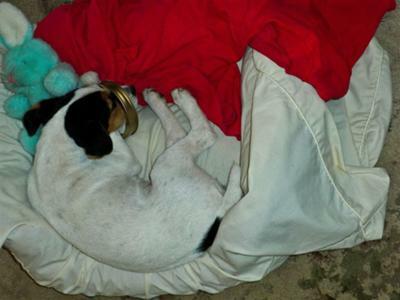 Simply click here to return to Visitors' Jack Russell Terrier Photos.